UT’s criminology and criminal justice department was awarded the Academy of Criminal Justice Sciences (ACJS) certification for its undergraduate program on Feb. 17. According to ACJS website, UT is now the first college in Florida to become ACJS certified. 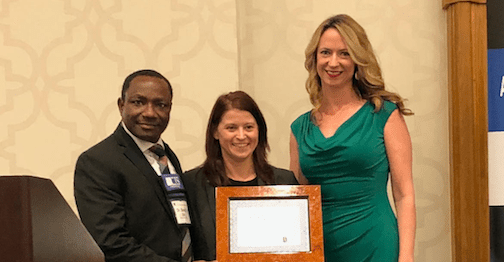 The award was received by Kathryn Branch, chair and associate professor of criminology and criminal justice, and Sorle Diih, assistant professor of criminology, during the ACJS meeting in New Orleans which took place on Feb. 13-17. The ACJS is an international organization that fosters professional and scholarly activities in the field of criminal justice. It is one of the two largest criminal justice organizations on the globe apart from The American Society of Criminology. Now ACJS certified, UT’s criminology and criminal justice department must now meet both the university standards and ACJS standards. Colleges get certified to ensure that they are providing students with the necessary resources and with the best education according to the ACJS standard. Some notable changes the department will see are: two-thirds of the core required courses for the degree must be taught by full-time faculty. Students must complete a required statistics course within their degree. And two- thirds of all full-time faculty in baccalaureate degree programs must hold an earned Ph.D. in criminal justice/criminology, or closely-related discipline. The rest of the standards can be found on the organization’s website ACJS.org. “This certification will benefit myself and other students when applying for employment and graduate school,” said Lucy Crouch, a junior criminology major. Throughout the ACJS certification process it is required that certified reviewers travel to and inspect each campus to see what is offered and what needs improvement. It cost UT $3,800 to have two reviewers from ACJS come for two days and interview students and faculty and inspect each resource the department has. In Davidson’s interview with the reviewers he mentioned that he would like to see more class sections added within the criminology and criminal justice program, because many times he has struggled to sign up for specialty classes because they fill up so quickly. UT currently employs 10 full-time criminology and criminal justice faculty and eight adjunct faculty. “[The award of this certification] really shows the tremendous work that Dr. Branch and Dr. Diih did to make this happen,” said Alexander Toth, professor of criminology. ACJS lists nine colleges in the U.S. that are ACJS certified including the University of Scranton and North Carolina Central University’s B.S. in criminal justice. UT will be number 10 on that list for its B.S. in criminology and criminal justice. This certification will give students credibility and set them apart from other perspective graduates. “We thought that this would be a good thing for us and for students because with their degree they can say they came from a certified program,” Branch said. You can reach Fallon Fischer at fallon.fischer@spartans.ut.edu.